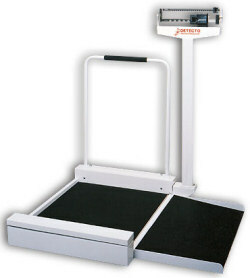 The model 4951 stationary mechanical beam scale provides the economical answer to the weighing of patients in wheelchairs. 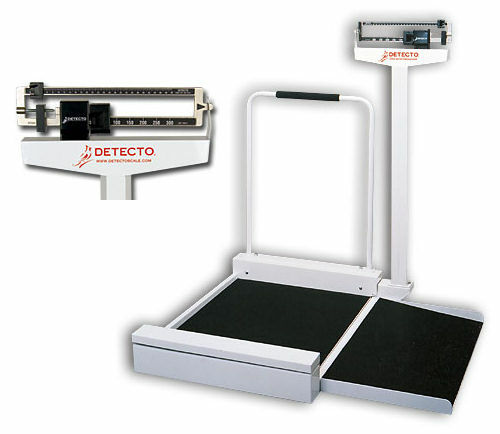 Its quality is inherited from Detecto's eye-level physician scale and incorporates a precision die cast weigh beam which is easily read from either side. The weigh beam is located at a height above the platform where the patient or attendant can perform the weighing operation. The ramp is removable and is covered with a non-skid mat. The die-cast, dual-sided beam is graduated in 100g increments for easy readability. Customers specializing in the care of nonambulatory patients provided information which was transferred into features and benefits of these scales, evident the first time you use the scale!